Two international projects showcase what can be achieved with flooring in high-traffic areas. High traffic areas have stringent needs when it comes to their flooring – they need to withstand heavy wear and tear, be easy to maintain, last for several years, and be aesthetically pleasing. Here we showcase two unique projects that prove once again that nothing is impossible as long as you have the vision, the passion, the determination and the right team with the necessary skills to help you achieve your goals. The 4 Bears Casino in New Town, North Dakota, USA underwent a beautiful transformation. One of the most notable aspects of the revamp was the installation of their new flooring. The 20 year old facility was in need of an upgrade which would create an exciting, comfortable and high-quality feel to the gaming floor. The client wanted to refresh an old, aging gaming environment with bold, rich colours that would provide a fun and exciting feel to the space. The yellow, red, blue and dark accents all work together within a custom pattern to provide a vibrant and exciting space. All of the custom décor elements, custom casework and cabinets, as well as custom flooring were manufactured and shipped to the jobsite for installation in just three weeks. Working to further streamline an extremely aggressive seven week onsite implementation, I-5 Design was able to complete the 1 580m² casino design and remodel in just five weeks. The carpet is a custom designed pattern on 1m x 1m carpet tiles. The existing flooring was removed and the new carpet was installed in four total phases so that three quarters of the gaming machines never had to be switched off during the installation. As this is a casino environment, both high traffic rating and comfort were important priorities. This specific product features an integrated pad which also saved valuable time during each phase of the remodelling. According to Aaron Carpenter from I-5 Design, who managed this project, there are several benefits of using carpet tiles, and for casinos, one of the main reasons for the selection is ease of replacement. “This product is installed with a pressure adhesive so if a carpet tile becomes visibly worn or damaged (this is typically not a problem with proper cleaning), replacement can take place in 10-15 minutes, which is shorter than what it would take to replace a broadloom product,” he explains. When looking at the carpet, it would appear as if the carpet is ‘moving’ or creating a wave-like effect. According to Aaron, this was intentional, and was achieved by creating a four-tile repeat of the pattern. “This particular pattern has a widening and narrowing effect that creates a full ‘swelling’ visual effect,” he says. The end result is a beautiful floor that literally mesmerises you the longer you stare at it. Casinos have to withstand significant foot traffic, and as such, these carpet tiles have been selected and customised to suit every single one of the client’s specific needs. This phenomenal project has been awarded several accolades, and when you look at the fine detail that went into this flooring installation, it soon becomes very evident why. This installation, called ‘The Sky Beneath Our Feet’, is a 6 410m² terrazzo artwork that includes iconic Pittsburgh landscapes. 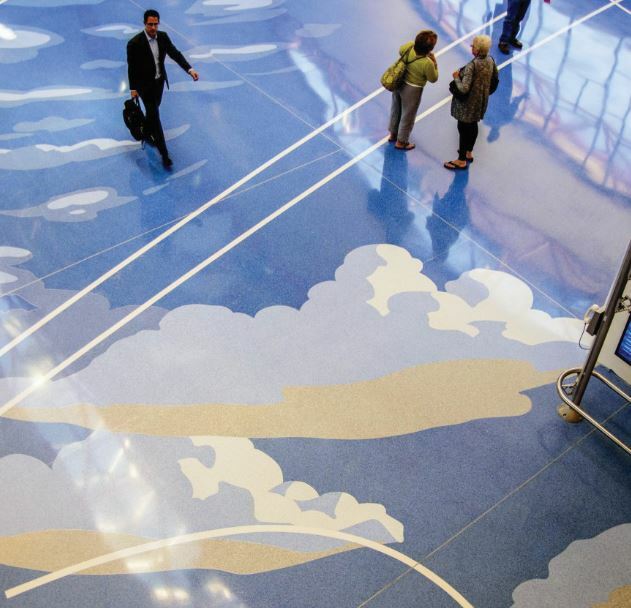 These landscapes border a blue sky, which swirls through the centre of the airport’s floor, extending the experience of flight and freedom to walking through the terminal. The process of translating the original two-dimensional design into an area larger than a football field relied on a unique partnership and collaboration between artists, architects and terrazzo craftsmen. The process began with detailed floor preparation. The substrate concrete was patched and coated with a flexible epoxy to ensure that the terrazzo would not shift with the movement of the foundation. This was completed in multiple phases in order for the airport to retain its functionality. Its design was stencilled onto the floor, then craftsmen outlined the shapes with thin zinc dividers. The terrazzo aggregate, a mixture of marble, quartz, granite, glass, and other chips, and an epoxy resin binding agent was custom-mixed to match the design colours. Similar to a paint-by-numbers exercise, each colour was carefully trowelled by hand to fill precise areas according to the design. Once the colours were laid out and curing complete, the surface was ground to a high polish. Multiple sealers were then applied, giving the colours added luminosity. This impeccable work of art is thanks to Clayton Merrell, and took a full two years to complete. To create the design, Clayton stitched together a digital collage using photographs taken by himself and others, eventually creating what would be translated into the piece of art that now spans the airport floor. Clayton also made a list of things that fly and started planning from there. There’s a paper airplane, a blimp, a helicopter and a bunch of other things. In fact, there are 12 Wright Flyers, so there’s a lot to discover, and if someone has a lot of time and they’re stuck in the airport, it gives them something to do. These two unique flooring installations demonstrate what can be achieved in high traffic areas. Fine attention to detail, a clear vision of the team’s goals, quality flooring products and a group of architects, designers and installers who are all specialists in their fields, are all factors that contributed to the success of these award winning projects.